Want honest content, but a bit ‘slower and kinder’ than traditional Calculus books? Like the way I explain things in Algebra I, Geometry, Algebra II, and Precalculus? It's a complete Calculus course. You can read it online (free, below) or buy a printed version. 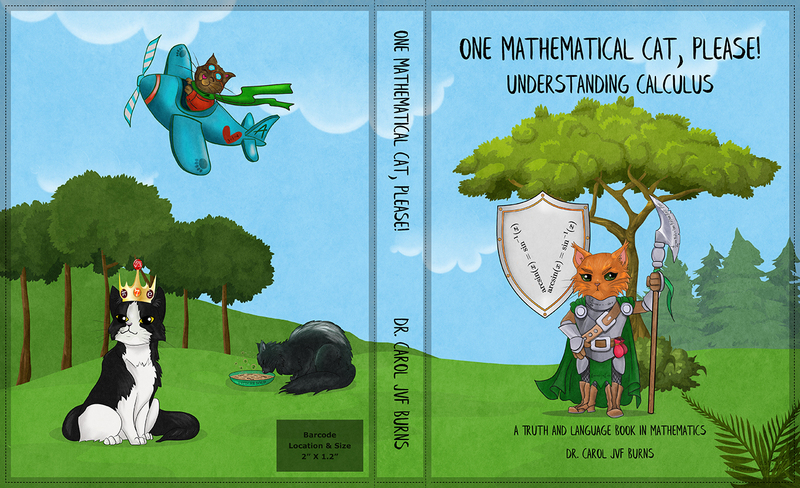 I call it the ‘warrior cat’ book because of the print-version cover (look left)! Gone through my online curriculum through Precalculus? Then, jump right into Chapter 3. Haven't been using my lessons? No problem. The first two chapters review essential material and introduce you to all the math language concepts you'll need. This link is for the COMPLETE book (a pdf file, about 47 MB). It's a BIG file, and may take time to load into your browser. So, you may prefer individual sections below. However, it's certainly easier to search for stuff when it's all in one place. who like to highlight, write in margins, feel the paper between our fingers. odd-numbered end-of-section exercises and Quick Quiz Problems. For ALL the solutions, I also offer a Complete Solution Manual. I also offer a set of Calculus Index Cards. Hold the entire course in the palm of your hand! The materials in green give unlimited online practice and/or supplement the text. Prerequisites for Precalculus (with solutions): also needed for Calculus!